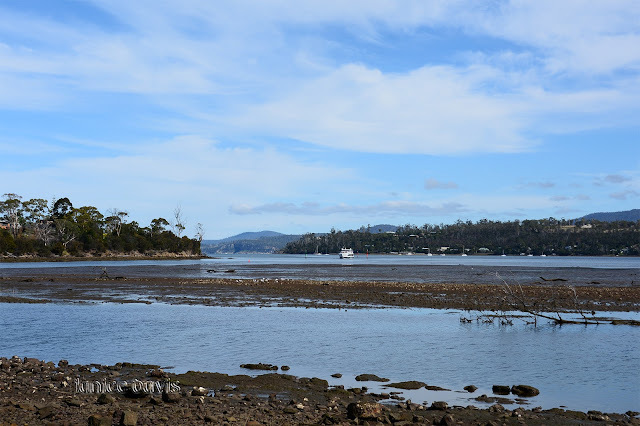 thoughts & happenings: Triabunna, Tasmania. Triabunna on the East Coast of Tasmania is a fishing village and it's also where you catch the ferry to Maria Island which has much to offer. Have never been there as a fair bit of walking is to be done and my husband can't walk that far on some of the uneven ground. Triabunna is the second largest town on the east coast and is 84 klm north of the State Capital Hobart. The name of the town is Aboriginal for the Tasmania Native Hen. It's certainly a busy town. There were two free parks with a couple of spaces left but we chose the caravan park. The lights - well they were on a fishing boat used at night time. The tide was right out so it doesn't look so pretty and you can see the ferry coming up the bay/river. Thanks for this ongoing tour of Tasmania! You are welcome, won't be that long and you will be doing a small part of it yourself. A very long flight to the other side of the world - certainly turn a lot of people off.. It is, would be comfy inside it. Un lugar muy ineteresante para pasar unas vacaciones. There is a fair bit to do in that area. 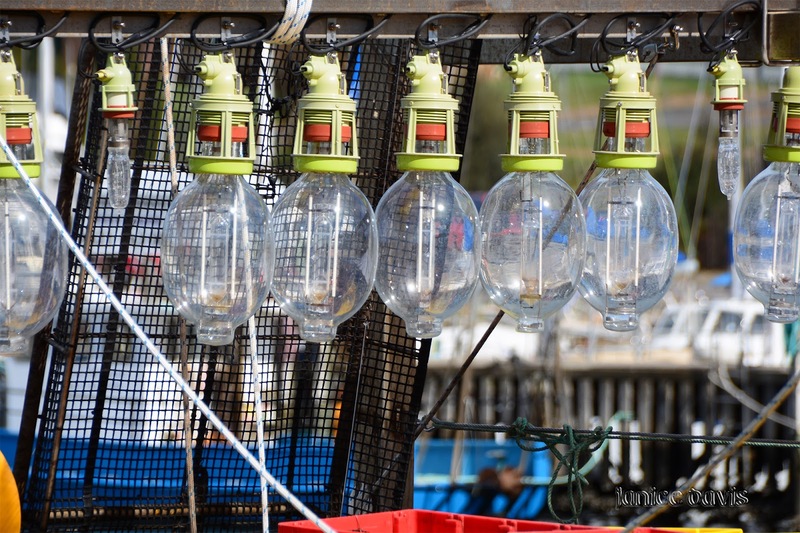 There is always something interest to photograph in a fishing village. I think the lights on the boat are used for catching flounder. There must be a good channel in the water for the ferry. It looks so shallow. That channel looks very shallow but it's certainly rather deep where the ferry is. I expect many a ship long ago had trouble. I would love to see those lights at night. I suspect they would be v bright - and beautiful. Andy's right--- Fishing villages are excellent for interesting stuff! Neat ferry. 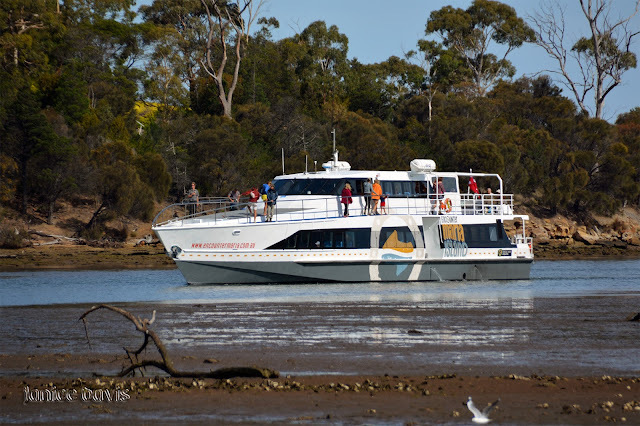 The ferry is kept busy so I'm told with tourist going across to Maria Island which has much to offer. There are school trips to the island, walking trips, nature trips and so on...the island was used for convicts way back. I too think the water does not look deep enough for the ferry. It doesn't look deep enough when the tide is out - but of course it is deep when you know. IT's a rather small village but it's nice. The skipper of the ferry must be very adept at his job...and very alert during low tides...to keep that boat in the deeper water of what appears to be a channel. He must be but there would be markers for him to know..
Lovely pictures! Nice to know about the place! Beautiful lights on the boat! Waiting to see the brightness of the light at night! I doubt if the light would come on in shore, would have to venture out to sea to look at them on..
That's a pretty little ferry. Even with the tide out the area looks nice to me. I love the night lights on that boat. It’s rather a nice spot, first glance it doesn’t look much but after driving around you get to know the place a little better and it’s sense of pull to you. It looks like a lovely place to visit. I hope you have a wonderful Monday. A good place to go for a trip by boat. 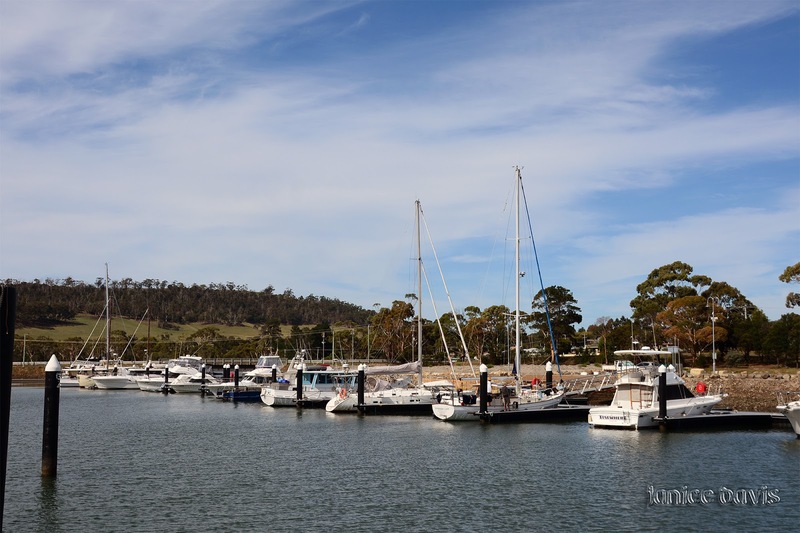 It is wonderful to know that this town has an aboriginal name - TRIABUNNA. Now Margaret you will have to photograph a Tasmanian native hen for your viewers to see and hopefully remember the name of this delightful fishing village. That ferry looks ULTRA modern.......should also move fast, I suspect, in Open water. Very good comprehensive report on Triabunna. we do not have tide here, and it is always interesting to see pictures of it. Oh really, that to me is amazing so pleased you told me/us that...thank you. Such a lovely looking place. Really enjoyed your selection of photographs.